To me, the some of the best stories are when the characters are very, very different from me in some ways, yet so similar in others. Writing a universal story is the goal of all authors, and Jyotsna Sreenivasan achieved this with AND LAUGHTER FELL FROM THE SKY. Who can’t relate to expectations big and small? Disappointments? Love? Exactly! Please welcome Jytosna Sreenivasan to Women’s Fiction Writers! Amy: While you have published short stories and several non-fiction books, AND LAUGHTER FELL FROM THE SKY is your first novel. Did you always want to write and publish a novel or did the story take over — and then, well, we know the rest! 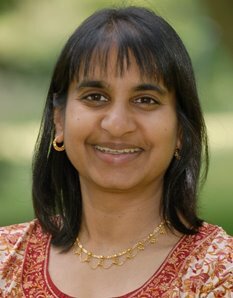 Jyotsna: In the 1990s, I wrote and published (with small presses) two novels for children. After that, I thought I’d try my hand at writing a novel for grown-ups. Little did I know how much of an education that decision would turn out to be! Writing a novel is so much work – it generally takes many years and many drafts – that most writers desperately want their first attempt at a novel to be published. Well, when has anyone’s first attempt at anything been a success? So it was with me. I spent many years revising and revising that first manuscript, and collecting a whole lot of rejection notes. Finally, I decided to move on to a second manuscript, and then a third. 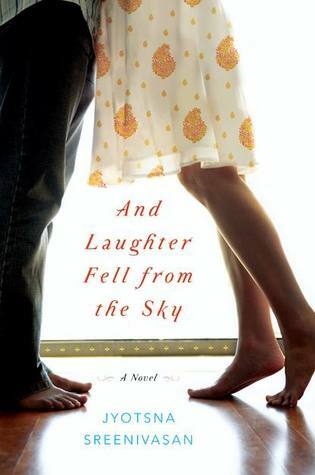 Third time’s a charm, and that manuscript (after many revisions) ended up being And Laughter Fell from the Sky! Amy: How and when did the idea for your novel strike? Jyotsna: And Laughter Fell from the Sky was inspired in part by The House of Mirth by Edith Wharton, and in part by my own life experiences as a second generation Indian-American. The main character in The House of Mirth, Lily Bart, feels a lot of pressure to marry the “right” person in order to be accepted by the wealthy New York society that she desperately wants to be part of. Lily’s situation reminded me so much of the pressure Indian-Americans feel to marry the “right” person – someone of the right ethnicity, religion, and earning capacity. So I wanted to write a novel about an Indian-American woman in a similar situation. Amy: Can you share with us a little about your journey to publication? Jyotsna: After I wrote the first draft, I had an acquaintance critique it for me. Based on her comments and enthusiasm, I did a revision and started shopping it around to agents. Eventually I signed on with my wonderful agent, Jenni Ferrari-Adler. I then did several rounds of revisions with her. She was very perceptive, and I so much appreciate the time she put into this. Once we felt it was ready, she started shopping it around to editors, and I was fortunate to catch the interest of my terrific editor, Maya Ziv at HarperCollins. Then I did more revisions with Maya, and her comments were right on. It has been an absolute pleasure to work with my editor, agent, the marketing folks, the proofreader, and the cover designer, and everyone else at HarperCollins. Amy: When a few editors and “readers” critiqued my novel, long before I had an agent, they said that since the main characters were Jewish, only Jewish people would want to read my novel or understand the cultural references. Obviously, I disregarded those bits of feedback, moved forward and my novel sold. Did you come up against anything similar in portraying Indian-Americans in your novel? Have you had anyone say anything like that since ALFFTS published in June? (And if they have, I hope you disregarded them as well). Jyotsna: I have not had those same kinds of comments. However, this might be because the Indian-American community is much smaller and newer than the Jewish community in America, and perhaps agents and editors just assumed that they would not be a big audience anyway. I think we assumed that most readers would not be Indian. I tried to make the cultural references understandable to non-Indians. For example, both main characters have non-Indian friends who ask questions that a non-Indian reader might have. I hope in that way to make the cultural references understandable to non-Indian readers. At the same time, I wanted to make sure not to over-explain, because that would be annoying to Indian readers! So it was a balancing act. Amy: What is your definition of women’s fiction? Jyotsna: I find it interesting that this novel has been categorized as “women’s fiction” or even “chick lit” since one of the two main characters is a man! However, it is true that it seems like the vast majority of readers (judging from my Facebook fans and blog reviewers) are women. So perhaps a good definition of women’s fiction is fiction that tends to appeal to women because of the subject matter. My story is a love story, and I assume more women than men are interested in love stories? I don’t want to stereotype, and certainly there are men who’ve loved this book. Amy: What’s your best advice for aspiring women’s fiction authors? Jyotsna: My advice for any aspiring author is to read a lot, write a lot, join a critique group, attend writing conferences, and just be open to what life offers. Writing and getting published can be so difficult that I’ve seen a lot of aspiring writers end up discouraged and bitter. I keep writing despite the difficulty, rejections, and setbacks because I love to write, I love to participate with other writers in critique groups, and I love attending writing and book conferences. It helps me to look at my writing and publishing activities as a spiritual journey, rather than as a way to achieve any particular goal. In terms of books that can help writers, I’d recommend Writing Down the Bones by Natalie Goldberg (as well as all her other books about writing), and The Artist’s Way by Julia Cameron. Jyotsna Sreenivasan is also the author of novels for children, and nonfiction reference books. Her short fiction has been published in numerous literary magazines and anthologies. She holds an MA in English literature from the University of Michigan, and a BA in English literature from Kent State University. She is currently in the process of moving from Moscow, Idaho to Columbus, Ohio. Previous Post: « What Happens When Authors Attempt A Vlog? Bloopers! I worry about things like that, too, when I’m writing about a region/area or its people or a people – because it’s not about “just that,” but about the human condition, the story. I do try to remain true to what and to whom I write but I more want to be true to the individual characters and their story – not sure that even made sense! Good luck to you, Jyotsna! And thank you for another wonderful author/book, Amy! This sounds like a fascinating book, Jyotsna. Good for you for being wide open to comments by your agent and editor, and for being stubborn enough to do the necessary rewrites. You’re a great mentor for all of us! What a wonderful attitude you have Jyotsna. Good luck with your journey! This sounds like a great read. Can’t wait to get my hands on it. Jyotsna, I really like what you said about writing as a spiritual journey, not just a means to an end. Thanks for sharing your wisdom! Thank you for reading and commenting! I enjoyed the comments. Love your cover! I’ll be ordering this one.